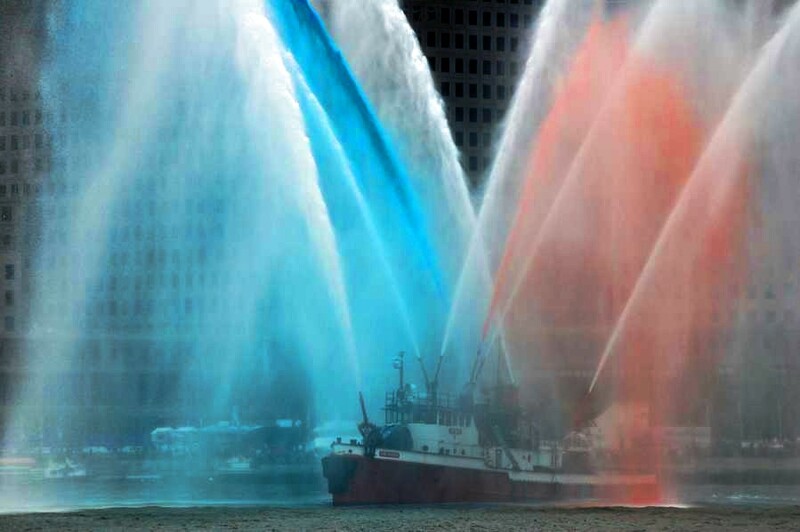 New York gave the Volvo Ocean Race fleet a tremendous send off, in two parts. First the majority of the fleet and then movistar, which had taken a 2 hour penalty due to winch problems that needed outside help, in the shape of a spare part. Light easterly breezes brought fortune and peril to six of the seven boats in the Volvo Ocean Race today. 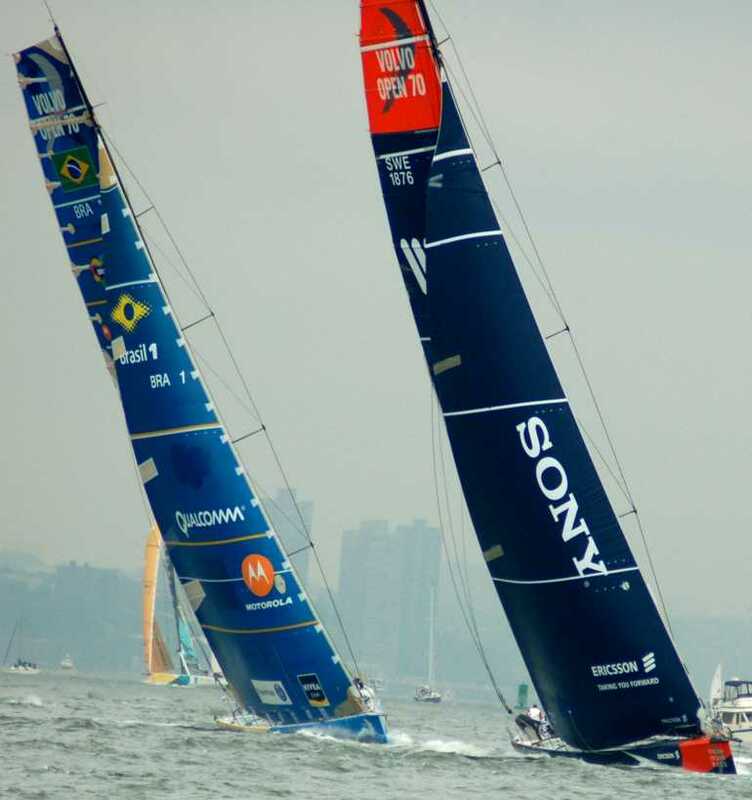 A starting line set close to New York’s Battery Park offered shore side spectators an unprecedented up close view of the race start, but for the competitors the proximity of the line so close to shore meant a very tactically demanding start. Paul Cayard, skipper of the Pirates of the Caribbean, mastered these conditions and hit the starting line near the committee boat on time and at full speed. Close on his heels were Brunel, Ericsson, and Brasil 1. 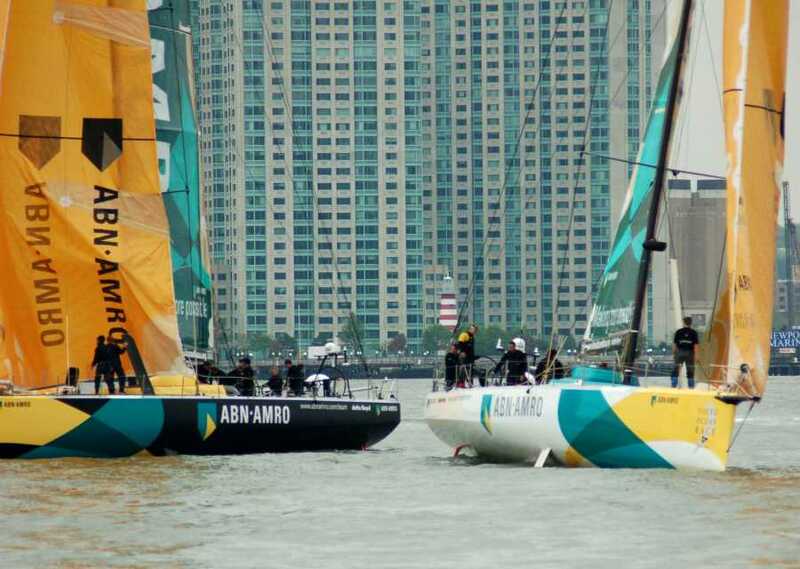 Further down the line, overall race leader ABN Amro 1 was caught up in a duel with their teammates on ABN Amro 2. One of the boats appeared to luff the other, resulting in both boats being caught with no speed or steerage when the cannon went off. After a minute of drifting backwards, ABN 1 was finally able to gain momentum and cross the line. Their teammates on ABN 2 weren’t so lucky, as they were pushed to the un-favored shore side of the course with very little speed. 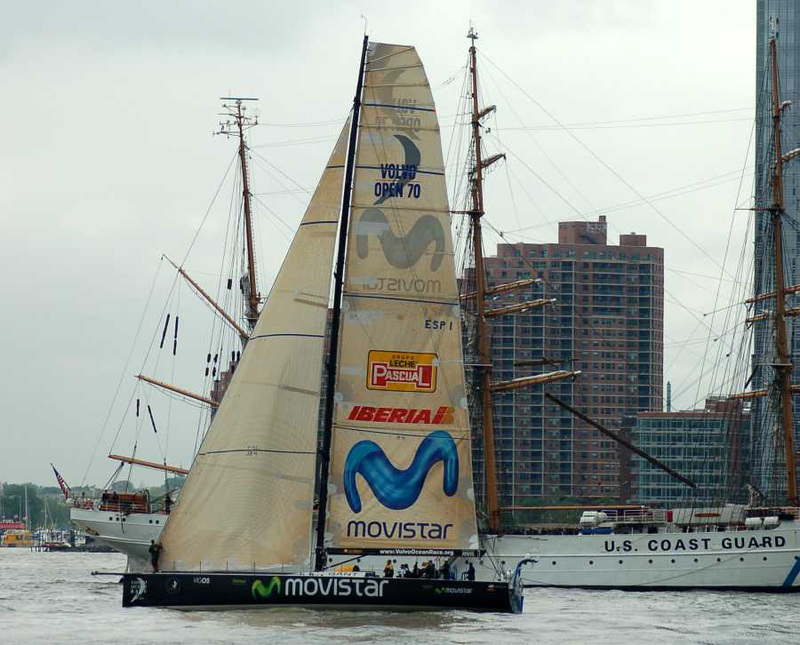 By this time, the first four boats were nearing the turning mark at the Statue of Liberty in a freshening breeze that allowed the fans on the water to finally see the awesome speed potential of the Volvo 70’s. 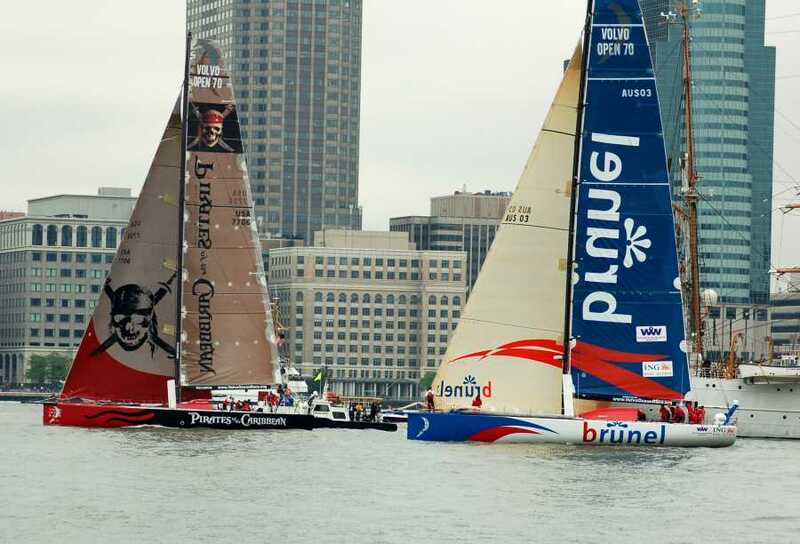 As the fleet neared the Varazzano Narrows Bridge, Pirates of the Caribbean had managed to extend their lead over second placed Brunel to 1:31. Ericsson and Brasil 1 were almost neck and neck at this time, with Ericsson holding a slim lead over Torben Grael and Brasil 1, but nearly 2 minutes behind the Pirates. ABN Amro 1 had found the freshening breeze to their liking and they were quickly catching the pack, trailing Pirates by 3:34. The “kids” on ABN 2 had a much bigger hole to crawl out of and were nearly 8 minutes behind the fleet leader as they headed to the open ocean and the Ambrose Light turning mark. Past the bridge, the Volvo 70’s started to excel in the flat water conditions with Pirates being clocked at 14.7 knots. The breeze continued to increase and soon the boats were preparing to reduce sail from genoa to job. Pirates were the first to go for the change and it was executed perfectly. Brunel appeared to have some issues with this maneuver, going bald headed for a short time. 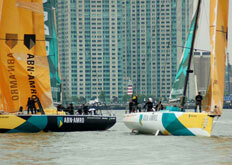 Ericsson also had issues changing sails, seemingly due to the fact that they are one of the few boats remaining using a headfoil instead of hanks for the headsails. Further back ABN Amro 1 was demonstrating why she is the race leader, closing the gap on the pack by nearly a minute. By the line at Ambrose Light, Pirates had maintained their lead and margin over the pack and continued out to sea. Brasil 1 had worked ahead of both Ericsson and Brunel and tacked shortly after the waypoint. The remainder of the fleet, a deadlocked Brunel and Ericsson, followed by a rapidly closing ABN 1, followed the Pirates out to sea. 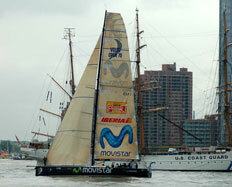 Meanwhile, the crew of Movistar was left waiting at the dock after being given a 2 hour penalty for receiving outside assistance to repair their winch system in New York. Finally at 3pm, they were released to cross the starting line and begin to chase their competitors across the Atlantic Ocean. Record or not, all of the crews are motivated to get to England. For McDonald, it is a chance to return home and be greeted by his wife, fellow ocean racer Lisa. For Mike Sanderson, skipper of ABN Amro 1, maintaining his teams overall lead may be on the back of his mind as he plans to wed his fiancée during the Portsmouth stopover. For the rest of the teams, the days of long ocean passages will soon be behind them and they can begin to think ahead to their next adventures.